So, remember when I used to blog? Please let me just start off by apologizing for my horrible behavior! I am so sorry that I left y'all hanging on my life and that you currently are just wondering what I could be doing that I can't blog about, but I assure you, I am safe and sound and trucking along the wonderful Israeli-Greek life :). Starting on Monday it will become Turkish as well! Who would have thought that I would ever ever go to Turkey! I sure didn't! So, let's see, last I left you I was in Israel, in Jappa I believe. As that was around a month ago there is no way that I can ever recount all that I have done, so, unfortunately I will only have to hit the highlights and leave off every single pastry that I ate, much to your dismay, I'm sure. So let me just start by saying if you ever get the opportunity to go to Israel, GO. I mean, I feel like that's an obvious choice, but I'm just telling you, you should make it happen. That trip was one of the most tiring trips of my life, as soon as we would hit the bus we would all fall asleep instantly. Our guide Yossi was absolutely awesome, we still mention some of his phrases such as, "Coffee in-Coffee out." I've mentioned our groups obsession with the caffienated beverage before, so it just makes sense that we would carry it with us to Israel. I'm not going to lie, we were not a happy group unless there was good coffee at our hotel/kibbutz. Yossi was just the best tour guide you could ask for, but he was definitely a non-stop guy. There were a few highlights from Israel for me. The best day for me was the Mount of Beatitudes. We started at the top and walked down the mountain on a beaten trail. It was SO muddy, but so green. I never really thought about Israel being green, but it really was. Anyways, we treked down the mountain and it was just such a happy day! We were all just laughing and loving each other and gaining weight fom all of the mud stuck to our feet, and just enjoying the beautiful views. I loved every second of walking down the mountain. But wait, the coolest part hasn't been told yet, we walked down the mountain and right to the shore of the Sea of Galilee. WHAT!! Who gets to do that! As we washed our feet and shoes off in the Sea of Galilee I just had the most surreal moment. Jesus was there. Jesus had just walked down that same path (we even found some of the Roman roads.) Jesus had put his feet in that very same water. It's just, such an indescribable experience. You never actually think of Jesus being covered in mud walking down a beautiful scene with his best friends, but he did. It was just one of the most peaceful wonderful moments of my life. Later we took a boat on the Sea of Galilee and it was also a wonderul experience. That was again just all of us together, happy and laughing, and just all very aware of how blessed we were to be there. Another highlight for me was when we went to more of the Nazareth area, aka, the desert. Oh my goodness, being from Tennessee I've never seen a desert in my life. It was insane. Just miles and miles of sand, everywhere you look. There were kind of sketch men with donkeys that would be like a free ride for the pretty lady ? But really, the rides weren't free, they wanted other forms of payment (SKETCH!). But, it was absolutely amazing to see, a complete beauty, but in completely different way. The rest of the trip we went to Jerusalem, and really. Jerusalem was just such a surprise, nothing of what I expected. The city is just layer upon layer of different people and different religion. The only commonality between everyone there is that they all believe they deserve the land. The wall between Palestine and Jerusalem was absolutely insane. Bethlehem is in Palestinian territory and so we got to go through, and it is just a completely different world. It is absolutely ridiculous, and makes me wonder if the world will ever achieve peace. However, as a whole, Jerusalem was way crowded and way commercialized. So, it just made me thankful that I can worship God wherever I am, and that it doesn't rely on the location I am in or the direction I face when I pray. I am just so thankful that we have a God who loves us and who wants a personal relationship with us. So, there it is. There was so much more about Israel and I'm so sure that talking to you all later I will share more stories with you. But there's the jist. I'll update you on some more soon. I have the Peloponesse, Barca, and not to mention our beautiful life here in Greece, which, PRAISE it's getting warmer! Today I went to the beach and it was wonderful :). I love you all, so much. Please forgive me for my lack of updating. Talk to you soon. Before I dive into everything that has been going on since our arrival yesterday morning in Israel, I need to catch you up on Friday and Saturday. Well, Friday morning started off with a tragedy, I'm serious. I was getting ready in the morning, my netbook on my bed, and somehow I knocked it off, cool clumsy Bonnie, right? Even cooler is that my screen was completely cracked. I'm not going to lie to you. I cried, a lot. Everyone was super sweet and offered to let me use theirs, Vicky (our greek teacher and also consierge type person) even offered to install and English program on hers and let me use it for the rest of the semester. Dr James took me and Angela to Kotsovolos, kind of the Greek version of best buy to see what options were. I left feeling kind of defeated looking at the ridiculous prices. Later, with some advice from mom and dad I just decided that I was going to go for it. So, Saturday we didn't have classes since we were leaving for Israel the next day, so Dr. James brought me and Angela to Kotsovolos where I spent an embarrassing amount of money on a new netbook, but I have since decided that it was completely worth it :). Then he took us to the Koropi metro where we went into Athens for the day! We explored the Plaka and did some shopping, I got a couple of things for some people at home and a ring for myself, we'll call it, "my greece ring" or we could not. So we just explored for a bit, met a super nice couple from Ohio, talked to several of the shopkeepers, one who remembered me from the other day, and just had a great time! At around 3 we took the metro back to Koropi where I met about 15 other people from our group to go to an AEK soccer game. It was AWESOME! The fans were just so excited, and it was in the Olympic Stadium!! Being the avid soccer fan that I am (Sarcasm intended), I had no idea what was going on, but it was just a really awesome experience :). We then got back and stayed up way too late packing and talking and just being excited! We definitely regretted that the next day though, we left bright and early at 7:30 for the airport. We safely arrived at Tel Aviv a couple of hours later, and I was just struck with the disbelief that we are in ISRAEL! It is nothing what I expected, I don't really know what I expected, but it definitely is not how beautiful this place is! So yesterday we were supposed to just come back to the hotel and sleep and get ready for the week and sleep, but our tour guide, Yosi, had other plans in mind. We went to the city Jaffa (Jappa), and it was absolutely beautiful! It's a seaside town of the Mediterranean, and it's where Simon the Tanner's house was. There was also a replica of an Egyptian gate that once stood there. We eventually got to our hotel and I took a two hour coma like nap before dinner. After dinner I went down to the beach with a few people and then we got Ice cream and talked to the girl named Gal that worked there. She was really cool, spoke perfect English, and was our age. I meant to go to bed early, but you know, we all just get to talking and before you know it it's past midnight and we're leaving the hotel at 8. Today was a crazy crazy day, but so incredible! I woke up early to have an excellent skype date and then had breakfast. After breakfast we set out to start our day. Before I tell you about it, let me share with you that it rained all. day. long. But that's okay! Everything was still great and Yosi kind of rearranged our schedule and showed us things where you could stay covered. We first hit up Caesarea, and it was incredible! We saw where the port was that King Herod built along with the public bathhouses and the theater. It was truly a way impressive city in it's day. It also just helps so much to picture Biblical stories and to bring them to life. After Caesarea we went to Mt. Carmel. It was pouring so we just went through the museum. I never realized before that the Phoenecians were actually the Canaanites, it put an entirely new perspective in my head. After Mt. Carmel we went to Beth Sherma where we saw caves where the Jews would bury their dead. It was so cool, and yet incredibly eerie. We're the first group to get to do that though, so that was definitely cool. As we were in further we sang a couple of songs and the echoing was just magical. We then ate lunch and got Falafel Shawrmas which I apparently love. They were super good! After lunch we went over to Nazareth. We started with the new church that was built over the ancient village of Nazareth. It was built in the 1960's so it's still quite new. We then got to see the ancient village of Nazareth. We saw the main square of the village, even typing this now I still just cannot believe that I was there, where Jesus for sure was. It's the most humbling awe-inspiring sight. Another super cool thing we did was we saw a recreation of first century Nazareth. It was really neat to see everything how it actually would have looked. This trip I can tell is going to change my life. It already has and is just going more and more daily. Since I've posted last I've just been making a real effort to get out and just DO things! The Metro has been on strike all week, so Athens has been out of the question, but it's still been a good week! On Sunday we had more of a lazy day and then went to church in Glyfada. 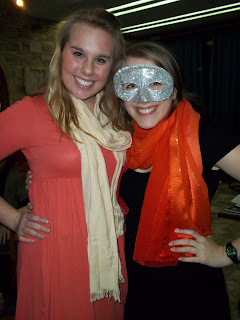 We attempted to sing in Greek, even though all of the sheets were in Greek so we had no idea where we were! I now am to the point where I can read Greek! I have no idea of what any of it actually means, but I sure can pronounce it :). 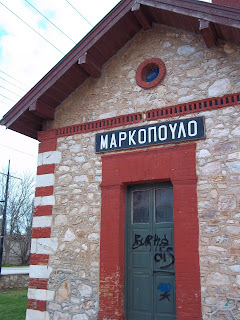 On Monday after classes a few of us decided to go check out a close town called Markopoulo, the busses run there and there is a really cute downtown area, so we decided to see what was there! Apparently, stores are closed on Mondays, but it was a lot of fun to be out and about and see what there is. This picture is an old train station that we found and explore for a little bit! It was a lot of fun, if not also kind of creepy! We didn't really do much for the rest of the night, but I'm excited to go back to Markopoulo when all of the shops are open! Tuesday I was absolutely exhausted, so after lunch and classes I took a pretty long nap :), I made up for my laziness by going on a run down to the beach and back with Angela. We then came back did some homework and ate dinner. After dinner we all walked down to the beach and had a bonfire! I was absolutely freezing so I hopped a ride back with Steven (the HUG assistant) and then just did homework and enjoyed a calm evening. Yesterday was a fun day! A few girls and I went to the Athens mall, and it is HUGE. There's like, four stories. Due to some transportation difficulties it took us an hour and a half to get there for about an hour of shopping, but it was still fun :). On the way back we had to run from the mall to the suburban to our transfer to our next bus, it was INSANE! I still don't know how we got back in time for dinner, but somehow we managed. Last night was when the real fun began. Victoria, one of the girls in my group had her heart set on going to a fashion show in Glyfada, but her ticket fell threw. Mark came up with the wonderful idea to have our own little fashion show! We all dressed up in ridiculous/cool/greek/whatever we had outfits and had our own little catwalk. It was so much fun! It was just one of those things that really makes you appreciate the group that we have here. Everyone just really does care for one another, I am truly blessed to not just be here, but to be here with the group that I am. Here's a picture of me and Victoria :). I love you all so much :). On Sunday we leave for ISRAEL!! I am so excited! Egypt update: We don't have to decide until two weeks before we are scheduled to leave on March 14, but from everything that I am hearing it seems like there is no way we'll be able to go there. That is super disappointing, but I'm just trying to look at all of the positives. The directors are planning a trip to Turkey if in fact we can't go with our original Egypt plans. I'll keep you updated! Please keep praying for the whole situation! Well, if I told you I'm really sorry that I haven't blogged in a few days because I've been super busy, that would be a lie. Instead I have sat here after classes, talked about homework and stared at facebook. Sounds familiar, right? The difference between what I did back in Searcy and what I did here is that no one is awake on facebook. So I stare at the exact same news feed for approximately eight hours. Living the Greek life. Apparently this is the rainy season, and also the Athens Metro workers go on strike season. So, as beautiful as Porto Rafti is, the dynamic changes when it rains for several days straight. Okay, okay, I'm done whining, the past few days really have been good, a little bit cabin fever-inducing, but still good. I really do love everyone in my group. I have found a wonderful bakery that serves the most incredible chocolate pastry thing I've ever had in my life. I had a personal goal to try every item in the bakery, but after I ate it my personal goal changed. Now it is to eat one of those every single day that I'm here. As Kelcey said "When in Greece, gain 50 pounds." Sounds about right :). Classes have started to pick up some, I have a few goals about finishing all the assignments due at the end of the semester as soon as possible, but yet, I always find myself staring at the news feed. Maybe on trips when I don't have internet that will change and my motivation will somehow find me. It still is hard for me to process that we are here for credit so along with that comes credit. I'm sure once we get our first grades back it will start to hit. On Friday a few girls and I went with Dr. James and Ms. Beth to the outlet mall. That was definitely a lot of fun! The things were pretty expensive still, but it was just fun to walk around and see what people here actually wear, and there were a lot of cute things! Then afterwards we went to IKEA. It was wonderful! So, that was definitely a fun afternoon :). I again said "yasas" to someone and they started spurting off in Greek. I should just learn to nod and smile and maybe they'll actually think I sort of speak it, but probably not. Last night was a lot of fun! I again went to get another one of those pastries in the afternoon after classes (yes, classes are on Saturdays). I'm starting to get to know the woman who works there and she's been helping me learn a little bit of Greek. She always cracks up whenever I try, but in the happy I'm trying type way. My southern accent, as slight as it is, doesn't lend itself to Greek. She's super sweet though, and I'm sure that I will be seeing a lot more of her! Then last night Dr. James gave us all euros to go out to eat so six of us girls went over to the taverna we go to a lot. That was just a fun night. My favorite quote from the night is from Brook "Hey, I worked at a doggie day-care. I KNOW my dog dynamics" I don't know if I've mentioned the large amounts of dogs, but they are everywhere! They sleep outside our hotel and then just follow us wherever we go. We've named them all and have very serious conversations concerning their well being. Then after dinner we all came back and played a huge game of Sardines. Nothing better :). Well, if you've made it to this point in my blog you're invested, so you probably want to hear about the Egypt situation. It's pretty crazy over there, I can't even really imagine being over there right now. 1000 prisoners have broken out of jail and are just running rampant over the streets. Osman, and his family have gone to Crete to stay with some family. They're trying to put in place a new government but as of now it is just pure chaos. Our trip there s still about six weeks away, so we don't really know what we're going to do as of yet. They're obviously not going to let us go there as it is now, Pepperdine already cancelled their trip for next week, but six weeks is still a long time. If we don't get to go they are probably going to try to plan another trip. We're also hopeful that the violence in Egypt doesn't move to Israel for more reasons than just we are to leave for Israel a week from today. So, here I am, just asking you to keep that whole situation in your prayers. As much as I really want to go to Egypt and Israel, and those were really the reasons I picked Greece, a 19 year old's trip isn't what is important here. Pray for the violence to stop and for a better way of life to be worked out somehow. I can't tell you how much I love it when people tell me that they're reading my blog! Thank you all so much for following through this incredible experience with me! Now, for the happenings of the past couple of days! On Tuesday I only had one class, Paul, which, if I'm going to be completely honest, I could hardly stay awake during! I really need to work harder at actually getting sleep, but it's so hard to go up to my room when everyone is down here until curfew every night. I'll definitely do better though! Since I only had one class Angela and I went for a little jog down by the bay. That's when we decided that we are way more out of shape than we thought and getting back into shape is becoming a top priority! Also, maybe I ate 6 too many cheese pastries before I went, don't judge. After class Kelcey and I pretty much passed out for 45 minutes in our room for the hardest nap I've ever taken in my life, but it was absolutely glorious! Then we had lunch and then.. the real excitement. ATHENS! Kelcey and I drove with Dr. Mike to the Koropi station with Mark and then waited for the metro. People here are just absolutely amazed that I would wear chacos in 60 degree weather so we got several stares, not to mention our American-ness and Mark's super heavy camera gear. We finally arrived in Athens with the goal of looking for the Poet shop, this incredible place where they make your sandals and then adjust them to your feet! The owner is the third generation to own this shop, he's made shoes for John Lennon and, wait for it, Bob Saget. I knew I had to have a pair! He's just a really cool guy in general, he went to underground in New York and has written several plays surrounding Greek Mythology. Kelcey and I were the first two done with our shoes, so we headed off to find things on our own with the plan to meet everyone at our embassy (aka. Starbucks), and we explored! We initially looked for the meat market, which I don't actually believe exists, and then we just decided to carry on our way. We went into a few shops and met a few people, of course practicing the 6 words we know in Greek. One woman talked for us for awhile, she spoke really good English and walked around teaching us different words :). I would love to go back there and actually buy something from the shop, she had such great items! We explored a bit more, and went into H&M :). I smile just thinking about that store. I only bought one thing, but when I went up to the counter I said "yasas" which is hello. The guy said something super quickly and when I gave him a blank stare he said, "Oh, you don't actually speak Greek do you?" I burst out laughing and was like no, but did you think I did?! And he DID! So basically if all I say is hello I can totally pass for a Greek person. Erm.. well, at least that I speak Greek. We met back up with everyone and went to Sabbas to get some gyros for dinner and then we had to RUN to catch the last metro. We just barely made it, but we did have to switch a few times, we were very proud of ourselves for navigating back on our own! Yesterday was a pretty relaxing day, with one exception. We had class and then four of us went to a bistro by the bay to do some homework while most of the group climbed "the mountain." While we were there we heard this noise in the upper corner of the roof. It was an absolutely awful sound, it was a squealing cat. It sounded like it was fighting something, everyone in the restaurant kept staring at the corner. We think...it died. The reason we think that? We heard whimper after whimper after whimper, until it finally stopped. It was awful! So, hopefully if you ever visit Greece you'll have more luck than this poor cat on the roof. Hopefully I'll have more luck than that poor cat on the roof, but I think I will :). I really am doing my best to try and update this as much as possible! Today was a pretty chill day so I'm just sitting in the common room area with everyone! I did forget to mention something that happened yesterday. I was in Mcdonalds just getting something to drink and Nicole came in and talked to me for a few minutes. When she left this man turned around and asked where we were from so I told him I was from America and she was from Scotland. He then proceeded to tell me about how he lived in New York for ten years (without papers, of course) and how it was just an incredible experience for him. His English was not so great, but he was just so excited to be getting to use it and to be talking to someone who had also been to New York. He was just a really friendly guy. Today was our first day of classes. I had three today and also chapel. I'm taking an ethics class that starts off my morning, and even though it's going to be hard to struggle through all of the issues, I think that it will really just help me grow into the person I want to become. Next we had chapel. It's so much more relaxed than it is at Harding and it's just really great to be with all of these people. Next was GREEK class! I absolutely love it! Our teacher is a native from Athens named Vicky and she is just the cutest woman you will ever meet in your entire life. She taught us how to say a few words, and also how to bargain, with the advice to the guys of saying "my mom is in the hospital". She is absolutely incredible and I am so excited to get to know her better! Not to mention I'm excited to actually be able to talk to people! We then had our Humanities class, it's pretty much going to be exactly the same as the one I took senior year, but it is really cool to be able to see all of the history while studying it. I'm excited about classes this semester, and I don't think I'll have any trouble with them at all! I just need to make sure that I do in fact remember that studying is very important :). After classes Kelcey, Zach and I bought our plane tickets to BARCELONA for the long weekend we get in the middle of the semester! I am SO excited! It's so crazy to me that I just bought the tickets! I mean, I have wanted to go there for a long time, but actually buying the tickets was just so crazy! I absolutely cannot wait though! It'll be nice to actually be able to read street signs for a few days! Then we had lunch and after lunch Kelcey and I decided to go out and explore. Oh dear, as we were walking down the street some Albanians started majorly hitting on us. They didn't speak much English, and obviously we don't speak any Albanian, so as you can imagine it was quite hilarious. They were in disbelief that we were wearing chacos and they were just absolutely freezing. We attempted to explain to them that it's actually snowing back at home so this 60 degree weather is absolutely wonderful! They then started to ask us if we could go get coffee and when I told them I have a boyfriend they were like "he's in America, he no see!" That was pretty much the point we had had enough so we left and went to the local store where we tried to explain that I needed to buy a straightener. They didn't end up having any, so we headed back, but stopped at a local bakery. While we were there we met this older woman names Lelia who spoke perfect English and is very very proud to be Greek. She followed the teachings of Pathagoros and believes in the 12 gods. She talked to us for a good thirty minutes and told us that she'd love to get to know us better and that we should stop by the bakery all the time. Kelcey and I are really excited and we're really hoping we can hear more about what she believes and share Christ with her. Not in a pushy way by any means, but God can work through a simple idea. So if you could all be praying for the two of us and also for Lelia that would be wonderful! Sorry that this post is so long! I just had ample time tonight while we're all sitting in the common room to type absolutely everything that happened. I love you all :). Oh dear, I sure have missed a few days, I'll try and fill in everything that happened though right now! On Friday we got to sleep in a little bit to try and compensate for how exhausted we were! I woke up around 7 though still because of jet lag and just it's so loud here! There are dogs absolutely everywhere! It's kind of funny because as soon as you leave the hotel they just follow you. They don't get up in your face, they don't bark (except at five in the morning), they just like to follow after you. So after I woke up I went downstairs to get breakfast and they have the most amazing fresh pastries that the breakfast crew gets from a local bakery. Seriously, the food here is just awesome, I should probably start another blog simply to describe it. Then a few people and I went around Porto Rafti to kind of explore. Sean was just dying to go visit this mansion we could see from across the way but Angela Nicole and I simply refused. It would have been another couple of miles and lunch was only about thirty minutes away! Later that night they took us to Athens on the bus and the Metro to show us how to get there and back. It was really cool to see everything, but I am just dying to stop and shop somewhere! We keep walking past all of these great stores and there just isn't anything I can do about it! I think on Tuesday a few of us are going to go back to actually explore and spend some money! On Saturday we left bright and early at 8 am to go into Athens, but it was well worth it! We went to the Acropolis and saw the PARTHENON! It was absolutely incredible to see all of the history behind that and oh-so many other buildings. I'll have pictures up on facebook and hopefully I'll be able to remember which one is which! It's just so incredible to see these buildings and to hear stories of things that even predate Christ. If you really think of how hard it would have been to build these things it can just blow your mind. Another incredible mind blowing thing is we went on top of Mars Hill. It was so incredible to just think that Paul was there. We sat on top of it and sang a few songs and Dr. James read Acts 17 to us. It was just so surreal and just really almost brought the Bible to life. This trip is just so incredible, and I know that I'm already growing so much from it and it hasn't even been a week yet! We then had lunch, and this should probably go in my food blog (I'm kidding), but we had an incredible salad with FETA cheese on it and amazing chicken and the best ice cream I've ever had in my life. I capitalize feta because I have learned over the past few days that I absolutely love it, but more on that in a second. Afterwards we went to another museum where we saw so many incredible things. Our tour guide is so funny! He keeps talking about how the British Museum stole everything and how they ruined everything. He really is so knowledgable about everything! Saturday night we went to the James' favortie "taverna" aka restaurant. It was so good! Again, I just have to mention that I love the food. Bethany and I got a huge chunck of feta and just ate it on bread and olive oil and pepper (Macaroni Grill thaaaaank you!). We've decided we're going to go there for many feta dates! Also, theres a girl named Christine who's around our age that speaks English so we're really excited about trying to get to know her better! And today! Today was a pretty chill day! I slept in accidentally but we didn't have anything really. I slept through breakfast but luckily my wonderful roommate is on breakfast crew and she got me a bowl of cereal :). This afternoon we left at three to go to church near Athens. It was an english service but they still translated it over to Greek. They have people from everywhere in the world there! It was really great to be able to meet some more people and I'm really excited to grow some relationships! Basically I'm having an incredible time. I love it here so much, it's just so incredible! I am struggling a little bit with missing everyone at home, but I know it is incredibly worth it. I just wish I could show everything to all of the people I love.